Wengen is on a shelf above Lauterbrunnen in the South arm of the Lütschinental. It is a fantastic location & the village is Car Free! 4. Take the Eurostar from London St. Pancras to Paris. Take the Metro to Gare de Lyon & the Lyria TGV from there to Basel. Change (across the platform) to Bern, change to Interlaken Ost. This is the Green option. 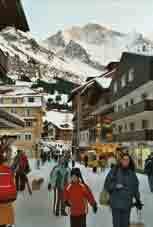 From Interlaken Ost, take the narrow guage BOB line to Lauterbrunnen, then the even narrower guage WAB train to Wengen. Or drive to Lauterbrunnen & park there. 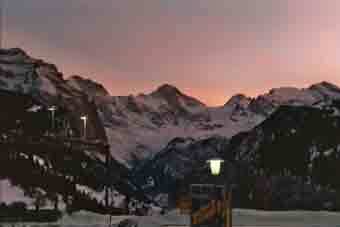 There are plenty of hotels on the Wengen web site. ...you need somewhere to stay. 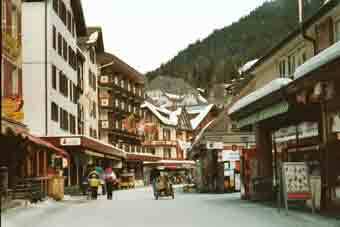 We stayed in the Hotel Brunner, above the village but on the ski-slope back, so it was fairly quiet but one could ski to town. 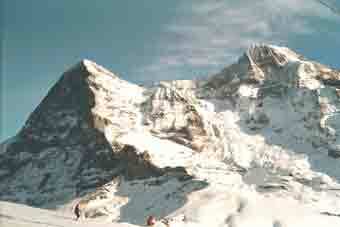 URL: http://www.art-science.com/Ken/Alpine/Wengen/index.html Last revised 6/3/2005 © 1998-2005 Ken Baldry. All rights reserved.